Mountaineering to the most celebrated of the Nepalese people, the Sherpas, is not a sport but a job. It is his lifeblood. Climbing has become a part of the Himalayan folklore and we at Mila adventures organize fully supported expeditions to the various mountain peaks that are opened for Mountaineering by the Ministry of Tourism. With years of experience, a proven track record and highly trained and accomplished mountain guides, we as a team we strive to provide the best possible service and results for our clients. Mila Adventures specializes in this part of the world and mountaineering is a part of its expertise. Once you have signed in with us, you need not worry about the logistics. From camping equipment to kitchen equipment, oxygen canisters to climbing ropes - we take care of everything. Above all safety and reliability are our foremost concerns. Located high up in the mountains, Nepal has always been a country of eternal fascination - the kingdom of the mighty Himalayas with Mt. Everest as its crowning glory. The lure of the mountains has always been inescapable. It has inspired poets to write verses, filmmakers and writers. IMAX films like "Everest" by David Breashears and the hugely popular book "Into Thin Air" by Jon Krakuer bear testimony to the appeal that the Himalayas have on people. Climbers come each year to tame these colossal giants. Some come for personal glory, some come on a quest - a form of psychological pilgrimage to set out not just to conquer this huge obstacles but also to attain a new level of understanding about the inner self - a search for the personal Shangri-La. With 8 peaks over 8000 meters, and the northern frontiers draped by high towering peaks, Nepal has always been a paradise for thrill seekers. And the simple fact that Everest, an overpowering attraction, was there to be climbed as the famous English climber Mallory had put it, drew in Nepal's first tourists - the mountaineers. After the first conquest of an 8000 peak, the Annapurna, in 1950 by a Frenchman named Maurice Herzog several westerners assaulted the highest peak in the world until an unknown beekeeper from New Zealand and a Sherpa for the Everest region stood on the top of the world. Now mountaineering has come a long way from those pioneering years. Now it is style in which you do it that matters. Several records have been made and shattered but still the peaks stand tall and proud. Unlike trekking climbing is an activity that cannot be undertaken alone by the client. As per Government rules it is imperative that climbers work in liaison with an agency recognized by Government. 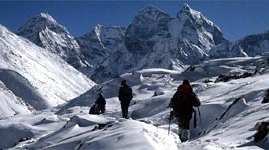 Peaks in Nepal are classified as climbing peaks and trekking peaks. Permits for climbing peaks are issued by the Ministry of Tourism. To apply for a climbing peak permit the following documents are required. Endorsement or recommendation letter of the National Alpine club recognized by the UIAA. Complete bio data of all the team members with four passport size photos. The receipt from the Nepal Rashtra Bank that royalty for the peak has been paid. For the second category of peaks classified as trekking peaks the permit is issued by Nepal Mountaineering Association, which is the national alpine club of Nepal.